Tonight is Saint John’s Eve, the traditional time to collect fern seed. It’s also a day when certain herbs are at their most potent (which I blogged about a few weeks ago); one of these is mugwort (Artemisia vulgaris). Native to temperate Europe, Asia, and Northern Africa but naturalized throughout North America, mugwort is one of several species in the genus Artemisia along with southernwood, sweet annie, wormwood, tarragon and a number of sagebrushes. It has fairly small, inconspicuous flowers but beautiful, fragrant leaves that are finely lobed and green above and silver beneath. You can often find it growing rather vigorously in waste places, greenways, and along creek sides where it prefers open ground and plenty of sun. 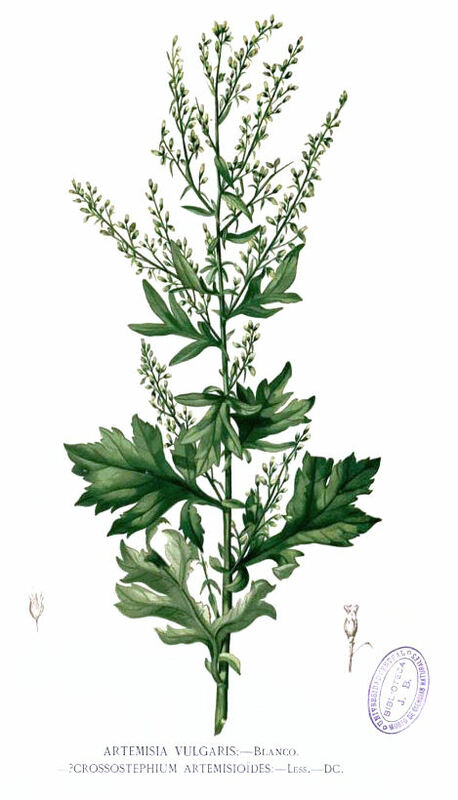 Mugwort likely gets its English common name from its use as a bittering ingredient in beer by the Anglo-Saxons where it pre-dates the use of hops, though Grieve in a Modern Herbal also suggests a connection with the word moughte (moth). In the middle ages, it was called St. John’s Plant or Saint John’s Girdle (Cingulum Sancti Johannis), because when gathered on St. John’s Eve it was believed to give protection against diseases, evil spirits, and misfortunes. Lore says that St John the Baptist wore the plant for protection in the wilderness. ‘Unas’ you are called, oldest of herbs. you may avail against the loathsome one who travels through the land. Many Anglo-Saxon leechbooks also state that mugwort is a traveler’s herb, which prevents a traveler from becoming tired and weary. Harvesting should be done on either Saint Johns Eve, or failing that, under a waxing moon before the plant flowers. In the Anglo-Saxon Leechbook of Bald it says that the herb should be plucked before sunrise (i.e. at night), first uttering the words “Tollam te Artemisia ne lassus in via” (I take of you, Artemisia, lest I grow weary on the road) and making a sign over the plant before it is gathered. The commentary in Sauer’s Herbal Cures, the first published American Herbal, gives us another glimpse at the nature of this magical plant. Mugwort is one of the key herbs in Pennsylvania German folk medicine and is used in a number of remedies like ague and fevers and is especially “devoted to the reprieve of womankind”. One German name for mugwort is beyfuss (goose foot), which is said to refer to the goosefoot tracks made by witches, and another is simply aldi fraa (old woman) which may also refer to the same goose-footed goddess of witches. Additionally it’s given as one of the green herbs used to flavor goose and other poultry. In Where Witchcraft Lives, Doreen Valiente has this to say about the herb: “Some old time scryers believed that it helped their powers to drink a tea made of mugwort before attempting to practice the art. Mugwort has from the earliest times had a reputation as a “witches herb”.” Valiente further relates the powers of the moon, the crystal ball and mugwort tea, which she testifies she finds “quite pleasant”. Modern witches often use mugwort to empower their divination tools. Since the late 19th century, mugwort has been used to stuff dream pillows as well. All this lore of night-flying geese and moths, dream pillows and divination tools, protection on long journeys under the watchful eye of the moon, gives us a picture of a powerful plant ally for dreaming and divination. Mugwort is a true witches herb which features heavily in our personal practice and a number of our products.